After two days of quick turnaround, a lot of washing and an alarm clock failure, Mark, Twiglet, Emma, Kvint and I hit the road at 4.30 on Wednesday morning. We had a long queue in Dover to get on the ferry and then a four and a half hour journey to de Peelbergen in Holland. Apart from a quick stop to get an OBU, which is how the tolls in Belgium are collected, which involves scanning your truck documents into a machine in a layby in the hope that it spits out a little machine, we had a very good journey, and for the first time ever I found the showground without a single wrong turning. Unloading was highly organised, the trucks parked by the stables to unpack, and there were helpers and free bedding, so the horses were quickly comfortable and had a good drink and a quick lunch so that I could give them a leg stretch. The facilities at the show were absolutely fantastic. A huge grass arena, and a second grass arena not being used, and four sand arenas, with a huge building housing the normal cafe/bar and three indoor schools. Several big local jumping/producing yards and other private investors, together with some government money, have been put together to provide a fabulous centre. This is the way it seems to be done in Belgium and Holland, having seen a similarly impressive show centre in Lier, and my understanding is that Sentower Park is even grander. It would be interesting to see if we could ever find sufficient private money in the UK to copy this way of attracting a really wide range of international competitors, and then craftily having lots of young horse classes to showcase our fabulous British bred horses. Centres like Pyecombe operate on a similar basis, but with a single investor/stud taking all the risk themselves, whereas this was on a very grand scale with maybe 20 investors providing an competition centre for 12 months of the year. Both horses trotted up well on Thursday morning, and Emma jumped in the 1.40 medium tour class in the fabulous grass arena in the afternoon. She jumped a lovely round to finish just out of the money. First up on Friday morning was Kvint, who also jumped on the grass. He jumped very well, but was rather ridiculously fresh and just had a fence down being silly. Emma jumped in the sand arena in the afternoon and just had an early fence when she didn't quite make a back bar, but apart from that she jumped very well, although in retrospect she has had a lot of back bars recently, and this did make me email Ed Lyall with a view to having a look at her when we got back to England. On Saturday I worked both horses in the morning, and then jumped Kvint in the 1.30 speed class on the sand. He jumped much better for having some work in the morning. This was a new experiment because he is a rather cold, lazy horse, and although he is charming he's never keen to over exert himself, but the result is that now he is very fit he suddenly wakes up in the ring and can be a little bit all over the place. I then jumped Emma in the medium Grand Prix. This was a fair old 1.40 with some big fences in it in a pretty tight sand arena, so would never be the easiest course for Emma. She actually jumped very well, and for the first few fences felt superb, but she had the back bar of a big oxer off a corner which made her a little bit worried so that she had two parts of the combination. All my hopes now lay with Kvint for the 1* Grand Prix. The course was a proper Grand Prix course in the sand arena. There were very few clear rounds, and Kvint managed to be particularly frustrating! I didn't ride him before jumping because he seemed tired - not true! He warmed up really well and jumped the first few fences beautifully before seeing a dragon and dashing off to the side so badly that I couldn't get him to the double and had to circle. He then jumped the rest of the course like a careful cat! So it was back to the drawing board. He is a lovely horse and has come from jumping 1.10 to 1.35 in 12 months, he is very fit and justifiably very pleased with himself. I will take a bit of a firmer line with him now, sort out our flat work a bit better and I think we have a lot of fun to come. We packed up quickly and had a very quick journey to Calais, and amused ourselves by listening to the live feed from the Hickstead Derby - what a great win for William Funnell. We were then held in the port for four hours because the freight part of the tunnel wasn't working and there were huge queues for the ferry. We got home at 1 am, very tired, with two tired horses. Slightly discouraged with my performance, no disasters, but no prizes either, there was some soul searching about why I couldn't do better on the way back. We'd had such a good show at Bolesworth and this one could have been even better, but that's the way it goes. I got back on Heidi on Monday morning, a quick lunge - or rodeo, and then a hack round the village. She looks and feels fantastic, and after a few days has settled down. The babies are spending their nights out now which is much better for their brains. It's been a rather busier week than anticipated: the power steering on the lorry wasn't working on the way back from Bolesworth or in Holland, it was a whistle stop tour to get that mended on Tuesday before meeting Ed Lyall to assess Emma. Emma was definitely sore - so she has spent two days of luxury at Sussex Equine Hospital having a full work up, X-rays and an MRI scan, and I am waiting rather nervously for the results and hoping that her problems are ones that will be easily treatable. At the beginning of the season, and especially in Lier and Windsor, I thought she jumped out of this world, but actually in Chepstow she did fail to get up a couple of distances which isn't like her (she has a monster stride) and from Bicton onwards I think she hasn't felt so scopey as normal. She jumped beautifully again in Bolesworth, but she has tended to jump her best on day 1 of a show - whereas I would normally say she gets better and better. The jumping and travelling is hard for the horses, and to assess her the day after a show and a 10 hour journey is quite brave, but I don't want to compete her unless she is 100% right, so we need to do the best by her. Horses aside I had a lovely trip to London to have lunch with my friend Sarah-Jane Tillard and to see her beautiful new house in London. So civilised and just a lovely grown-up break from the horses, and my sister, Polly, and niece, Eliane, came to stay on Friday night on their way back home to France. I just love this fantastic weather, hot for riding, but lovely long, warm evenings - I can hardly ever be too hot. We had a very exciting evening watching the Global Champions Tour in Monaco last night where Shane and Ipswich van de Wolfsakker won the 5* Grand Prix. What an amazing achievement for Shane and a relatively inexperience, but very special horse, but also for Nattie who works so hard to make sure the horses are at their absolute best for the competitions, and the whole Breen Team. Askeaton and Kvint are gearing up for shows at Felbridge and Pyecombe next week, and Heidi is also entered for Pyecombe, so hopefully we will have the whole team in tip-top shape for the Royal International Horse Show at the end of the month. As always many thanks to the team here, Steff, Camilla and Izzy, to Cinder Hill Equine Vets, Sussex Equine Hospital and the Casserly family who keep the horses on the road, and my sponsors Saracen Horse Feeds, MacWet Gloves and Just Equine, along with Stride Management who make life so much easier. 3.00 am, 12th February and the adventure began. My co-driver Becky Day, kindly found by William Bunn of the Equine Driver Agency, and I loaded up Doonaveeragh Emma, Luendi and Espirito Santo and set off for Dover. We met the two Breen lorries in Dover and then started the three days of driving to Southern Spain. We spent the first night near Poitiers in France and then drove into Spain and over the Pyrenees to spend the second, very cold and windy night, near Valladolid. The third day was full of spectacular scenery, when you see Flamingos on the side of the road you know you are a very long way from Nutley. Sadly we had a blow-out only 10km from the show, but crawled slowly on to find that Jade had kindly bedded up all the boxes, and while Shane's wonderful team of Nattie Biderman, Leo Tierney, and Harriet Webb and I settled the horses, Edward and Julia Bunn and Becky sorted out the lorries, parked them and hooked them up for us. Sunday morning was spent discovering the beautiful hacking round the golf course, about 40 minutes worth of sandy tracks, and then on Monday Luendi and Espirito Santo had to get to work as they were jumping on Tuesday. The course for the six year olds was very straightforward, but it was 1.20 - bigger than they had jumped in the ring. They both jumped well for a few baby mistakes, and rather surprised their breeders Shane and Michael Quirke who thought they were both five and were a bit perturbed that I might have embarked on a rather ambitious plan! They jumped well on Wednesday and then didn't jump on Thursday when the course did look a bit strong. Mark, and my great friend Pippa Green arrived on Thursday just in time to watch Emma wing her way rather strongly round the 1.20 for 6th. Pippa very kindly took my washing back to her house, what a luxury, and Mark settled down to lorry life. Emma was rather wild in the 1.30 the next day resulting in a bitting re-think, and a good clear in the 1.30 on Sunday. We had a wonderful dinner with Chloe and Shane at La Fontanilla on the beach in Conil on Saturday and on Sunday the washing was returned, lovingly ironed, and Mark departed for Sussex. The second week the weather started to warm up, Luendi jumped not only her first ever round on grass, but they both made a great start to the week to be equal first. They continued to jump well for a few baby mistakes, but both improved every day. Luendi having always been very quiet to ride also took up some very alarming bucking, a new party trick to add to escaping from the stable - she can get under the lowest stall-guard while you are getting the quickest bucket of water. Emma jumped consistently well in the 1.30's on grass for some low placings, and another week was over. Week three started with Espirito Santo jumping really consistently and Luendi having a few helicopter moments when she thought she was faced with a big oxer. Luckily there was a permanent clear-round ring on grass with two courses, one at 1.10 and one at 1.20, so a few goes round both rebuilt her confidence so that she presented me with a clear round and an excellent start to my birthday. When I got back to the stables Nattie, Leo and Harriet had decorated my stables with balloons and streamers and cards, what an amazing team of friends, it really made my day. Mark and Sophie arrived in time to join us all for a birthday lunch and a delicious chocolate cake kindly bought by Jade - absolutely scrumptious - so bad luck for those who gave up chocolate for lent! I escaped from the lorry to the charming Califa hotel in Vejer for four nights while Mark and the girls were with me. What a luxury to stand under the shower for as long as you want, and also not to have it on a funny angle. It was lovely to have a little chance to explore Vejer which is an really charming old fortress town on the side of a steep hill. We also took the opportunity to pay Nattie, Leo and Harriet back a little bit for their kindness with a delicious Moroccan meal in the hotel. Emma jumped well, but sadly had a fence down in all three classes at the weekend. There was a little bit pressure of wanting to do well for Mark and the girls, and as is often the way I do less well when I think I should win than when I think I am going to die! Sensible advice on keeping my hands up, and a lot of work on improving the canter more, and concentrating on giving Emma plenty of room in front of the fences ensued. I said a sad goodbye to everyone after breakfast on Monday and we were on to week four. Both the six year olds jumped well over courses well up to 1.25, although Espirito Santo felt so tired on the 3rd day that I pulled him up. Luendi jumped a good clear round and made a couple of baby mistakes on the other days. With increased height and difficulty and babyish horses small mistakes are quite costly, but they both improved every day. Click on the photo to see the slideshow. Week four was the highlight of my show. I opted to jump the 1.35 Accumulator in the main ring on Thursday. Walking the course it looked good for Emma. Nice lines early on to settle her and not too big at the beginning. Obviously, being an accumulator, it got bigger and bigger, until the Joker which was just the same size as Reiko Takeda of Japan - 1.50. Emma jumped a fabulous round to finish 8th. The second day Emma was a little bit silly in the 1.35 and I thought we were lucky to only have four faults. I then discussed with Shane whether to play safe and jump the 1.30 on Sunday or to go for the challenge of the 1.40 Grand Prix. We decided to go for it on the basis that if it didn't go well we had another week to drop down and put things right. What a great decision - she was unbelievable, just tipping the second last fence for 12th place in our first 1.40 Grand Prix. Then it rained! Tuesday was just English type rain - we had no idea what was to come. Rabbit dropped down to the five year old's, which was 1.20 and jumped a super confident round, and Luendi jumped confidently round the 1.30 six year old's although she had a couple of poles and in retrospect I think she was very tired. On Wednesday night it really rained, so that on Thursday morning the whole show was under two feet of water and all the competition was cancelled. Only the Irish and a handful of English seemed to think it was possible to ride at all! On Friday I moved Emma from the 1.35 on grass (which was subsequently cancelled) to the 1.30 on sand - she jumped beautifully but I never got to walk the course and had to ask the pole picker the way after fence 6 - which resulted in a fair few time faults! She jumped a great round in the 1.35 the next day just knocking the second last. I was travelling and turning, but I'm not sure I was actually riding! On Sunday we once again woke to two foot of water, a delayed start to all competition, ring changes and rider meetings. Eventually the 1.40 Classic Grand Prix went ahead on really good going, but a small sand ring which made an extra challenge for Emma. She actually jumped a good round, but found two distances short and just tipped the last part of the combination. There was a difficult turn to the last double which I just didn't make, so rather than pull her round to it I cantered past and came to it evenly for a lovely finish. Click on the photos to see the slideshow. My lovely next door neighbour Karen Rees arrived on Sunday afternoon to help me with the long drive home. Sadly she was cheated out of a spectacular view of the Pyranees by a landslide which closed the main road. We got an in depth view of the industrial towns of Northern Spain instead and she was a little bemused that the border between Spain and France is totally invisible - although lots of people get stopped and fined on it! We had a very cold stop at Valladolid and then a very comfortable stop with Alison McIvor at her wonderful new home and stables near Angouline in France. We can highly recommend the delicious supper, beautiful setting and very comfortable beds. Finally we arrived home at 10.30 on Wednesday evening. Business as usual from Thursday morning, seven to muck out as we bought back horses for Shane and for Brian Cassidy and then full speed ahead for the new washing machine. My second biggest travel adventure is now over. The first was back-packing around India and South-East Asia when I was 21. I did look at a map before I went this time and came back without dysentery, just the Sunshine Tour cough. What an amazing opportunity: I learned so much about the horses, and I expect about myself; with the help of the amazing Emma I achieved things that I thought were impossible, and the six year olds really surprised me with their boldness and their improvement. Both of them were only jumping Newcomers when we left and are now flying round 1.25's. Obviously I couldn't have hoped to achieve all that without the support of Mark, endless pushing and encouragement from Shane, Chloe's organisation and the help and support that I had from Nattie, Leo, and Harriet at the show, and definitely not without Karen helping me drive home. Last, but definitely not least, thank you to Debs Coles-Vincent of Diva Equine and Country who provides me with beautiful bridles, saddle cloths and Cavalor supplements. The Arena UK Festival is the final fling for the outdoor season, with classes from British Novice to Horse of the Year Show Wild Card qualifiers and every category having its own Grand Prix. Having changed my mind quite a few times I finally set off for a whole week with all four horses last Sunday. The thought of doing four horses at a show on my own and competing for a whole week was quite daunting, but the value of taking the youngsters to a stay away show and jumping them in several classes won the argument. By supper-time on Sunday all four horses were safely settled in to their boxes, backing onto seven Breen Equestrian horses all being looked after by Nattie Biderman. I only had Doonaveeragh Emma to jump on Monday, in the 1.25 Star of the Future qualifier, and she was drawn 190th giving me plenty of time to exercise the other three. The bigger classes at Arena UK are run in the fabulous indoor school, which makes a great start to the indoor season, and Emma was in fabulous form. I just let her run me to a double in the jump-off and had a pole coming out. With 200 in the class and only 40 to qualify for the final it was a very fast class and I think I would have been a tiny bit slow anyway. Luendi very unfortunately broke her pedal bone in the field at the beginning of April and so was at her first show since the beginning of April, so I gave her a quick jump round the clear round to see how she felt. First thing on Tuesday Espirito Santo jumped in the very scary Newcomers in ring 1, just having the last fence in the jump-off. Both Luendi and Finn jumped really well in the Discovery, Luendi was thrilled to be jumping and Finn gave me the best round he has jumped yet. On Wednesday Espirito Santo jumped in the five year olds, once again in ring 1, and a very up to height and difficult course. He just had one fence towards the end of the course. Emma jumped a lovely, but not quite quick enough, double clear in the Foxhunter and Luendi and Finn had a day of hacking and schooling. On Thursday Emma jumped in the 1.25 in the indoor school, just getting a bit close to a fence when I turned quickly in the jump-off. Luendi jumped really well in her first 1.05, and Espirito Santo had a quiet hack. Friday was the last Foxhunter qualifier and brilliant little Emma was 5th, qualifying easily for the Grand Prix on Saturday. Espirito Santo just failed to qualify for the five year old final and Luendi and Creevagh Doonaveeragh had a quiet day. 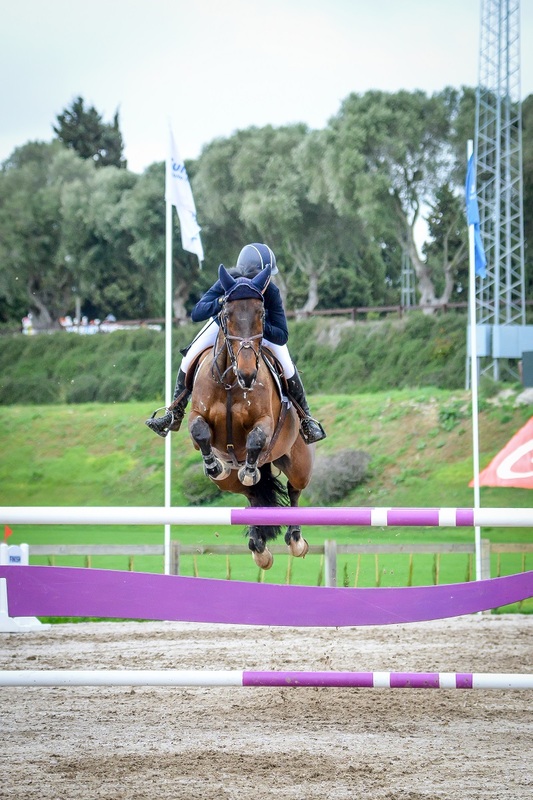 On Saturday Espirito Santo swept round the Newcomers to be placed and qualify for the final, and Luendi jumped in the Discovery in spooky Ring 1 to qualify for her final. Obviously the day was going far too well, as I had a totally blonde moment in the class I most wanted to do well in - the Foxhunter final - and missed out the fourth fence when Emma was jumping like a super-star. I was absolutely furious with myself - even with Shane helping I had got myself very het-up in the warm-up and I really don't know what happened to my brain - I had walked the course twice! 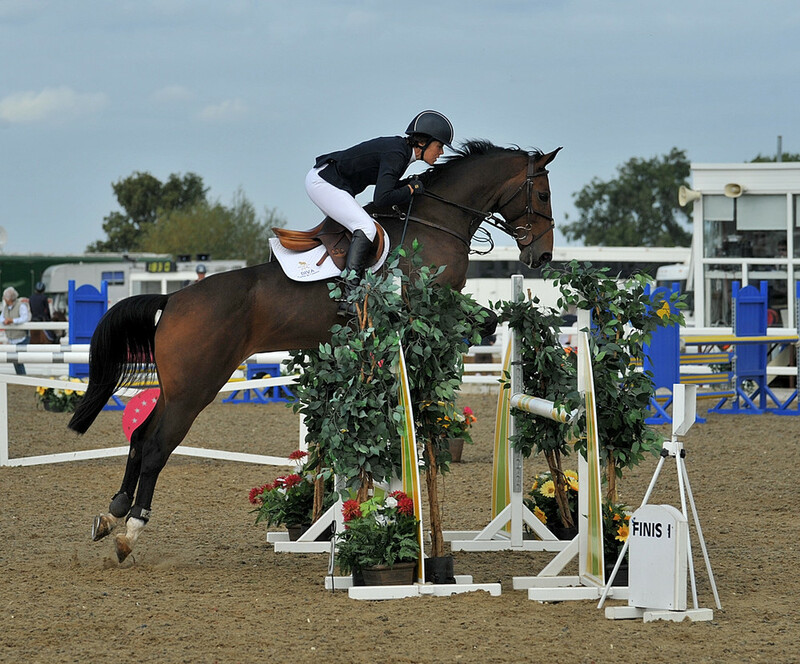 Luendi qualifying for the Discovery Grand Prix. I decided that Luendi and Espirito Santo had jumped enough for the week and so having paid my bill I trundled home, and the horses had the most lovely afternoon out in the field in the sun. It had been an excellent show, with great classes to watch every evening. Both Louise Pavitt and David Simpson did fantastically in the Puissance and David narrowly missed out on winning the Major Grand Prix. Espirito Santo has come on so well in the last few shows and positively took me round his last class. I was thrilled to have Luendi competing again - she is great fun - enthusiastic, brave and careful. We were a little bit disorganised at times, she has missed so much learning work over the summer. However, she has matured physically and is ready to spend the winter catching up with her peers. Both horses managed to qualify for their finals - only the top 30 in each class of over 200 qualified - so they both showed that they can be competitive. I was disappointed not to give Emma the chance to be really competitive in her final, but on the plus side we felt like a really good partnership all week and we both felt totally confident again having had a few wobbles since we got back from France.